The Executive Flags of the United States are official flags designated to represent particular offices in the executive branch, most notably, the President of the United States. 1882. Although discussions about a President's Flag occurred during the deliberations for the Flag Act of 1818, a President's Flag was not officially adopted until the administration of President Chester Arthur in 1882. Initially, the flag was issued by the Navy and primarily used for maritime use. 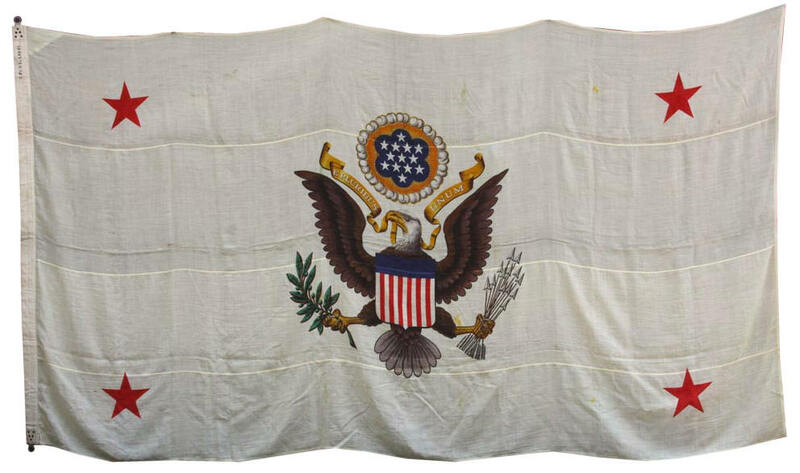 The Navy order of August 9, 1882, reads: "The flag of the President of the United States shall consist of a blue ground with arms of the United States in the center, and shall be of the dimensions prescribed for the admiral's flag [10.2 by 14.4 feet (3.1 × 4.4 m)]. The flag shall be hoisted at the main of vessels of war while the President is on board, and shall be carried in the bow of his boat." 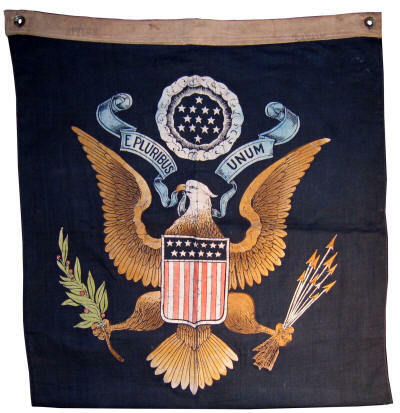 The earliest flags featured the pre-1885 Great Seal, with eagles in white with bent legs and white olive branches and arrows. In 1885, the Great Seal was redesigned, and at some point before the turn of the century, the eagle was updated to the full color 1885 Great Seal design. 1898. By 1898, during the Spanish American War, the Army determined that it too required a flag to represent the commander-in-chief, though the Navy's flag of the heraldic eagle on blue ground too closely resembled the Army regimental colors. General Orders No. 13 on March 28, 1898, prescribed a scarlet silk flag with a large blue star in the middle outlined in white which contained the Great Seal. There were four white stars in each corner, and scattered between the angles of the large central star were 45 small white stars, representing the 45 states. 1902. In 1902, President Theodore Roosevelt selected the Navy flag which was older and had been selected by a former President, as the official peacetime flag to avoid confusion and determine a single flag to represent the Presidency. 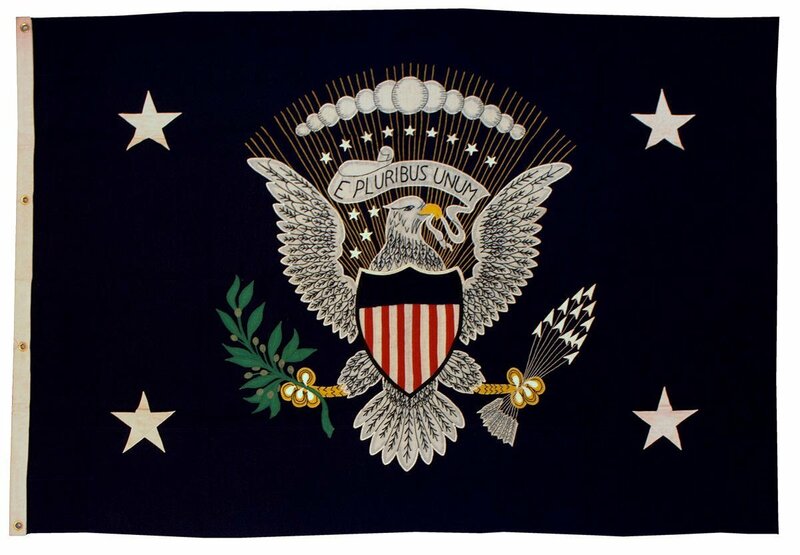 The 1902 flag introduced minor modifications to the Navy flag of 1882, most notably the eagle, scroll and arrows being depicted in pure white with black outline, and the ring of clouds surrounding the six-pointed star constellation being replaced by a ring of rays. Both services retained their original Presidential flags as wartime flags, though the Army redesigned their wartime President's colors in 1912 from its original scarlet to a blue ground. 1916. In 1916, President Woodrow Wilson noted the two military Presidential flags being carried in a parade. 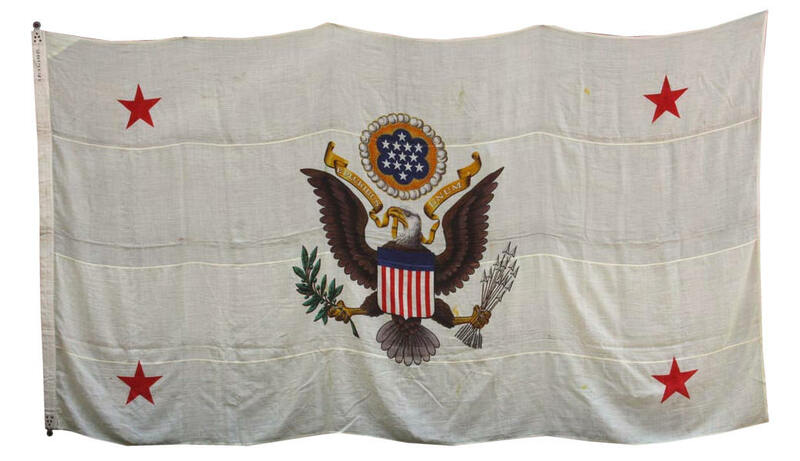 With input from Secretary of the Navy Byron McCandless and Assistant Secretary of the Navy (and future President) Franklin Roosevelt, President Wilson decided to combine aspects of the Navy and Army flag into a single flag. The four white corner stars of the Army flag were retained, and added to the Navy flag's design. The 13 stars surrounded by a ring of rays was replaced by white cloud puffs in an arc above an arc of 13 stars. 1918. During World War I, Army orders were issued for flags for the Secretary of War, Assistant Secretary of War, Chief of the General Staff and full General. The Secretary of War and Assistant Secretary of War flags followed a similar design to the President's flag, though in white on scarlet (Secretary of War) and scarlet on white (Assistant Secretary of War). 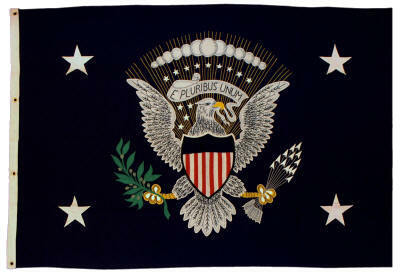 A "Style 2" Presidential Banner in the 1885 Great Seal design with full color eagle. Note the rectangular shield and ring of clouds surrounding the six-pointed star pattern. Hand painted on cotton. 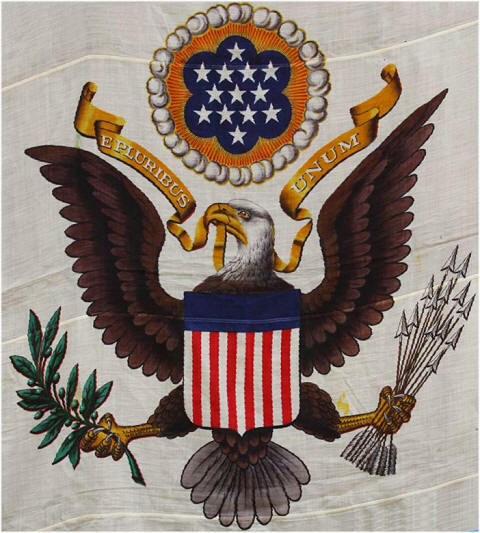 when President Truman adjusted the flag due to some criticism that the eagle's head on the 1916 flag faced toward the clutched arrows (to many, signifying war) and toward the left (known in heraldry as the sinister side). The eagle was turned to the right (the olive branches) and was once again depicted in full color, rather than in white, and the four corner stars were replaced by a ring of 48 stars. This design has essentially remained unchanged, with the exception of President Eisenhower approving 49 stars in 1959, and 50 stars in 1960. The design has been adopted not only as the President's Flag design, but also for the Seal of the President of the United States. Today. Today there are several other Executive Branch flags in use, to include our Secretary of State and Ambassadorial flags, our Secretary of Defense and Defense Senior Officials flags, and others that represent U.S. Presidential appointees to the highest offices in the nation. These flags and their history trace an important lineage through American heraldic symbolism, and collectively they represent the power of the Presidency, the highest American executive office bestowed by the American people.